One day I was traveling in a cab in Chennai. Suddenly the cab driver started the conversation. We started discussing things mainly politics, suddenly we straddled in to history. He was trying to explain me about Dravidian history and Lemuria Continent where originally Tamil people lived and all that. I politely responded to him after his session, “Sir, this is not history but propaganda”. Only narratives such as these did not help Tamil Nadu achieve its full potential. This is a cooked up history by British (or in particular Christian Missionaries) to keep the people divided forever to perpetuate their rule over us. Then I told him that the Dravidians cannot contradict themselves. They propagate two theories, one they say that they lived in Lemuria and on the other hand they say that they were living in Delhi and were ruling all over India when Sanskrit speaking Central Asian Brahmins or Aryans came and drove them to Tamil Nadu. Both can’t be true. Then he looked slightly confused and eventually abandoned the topic. 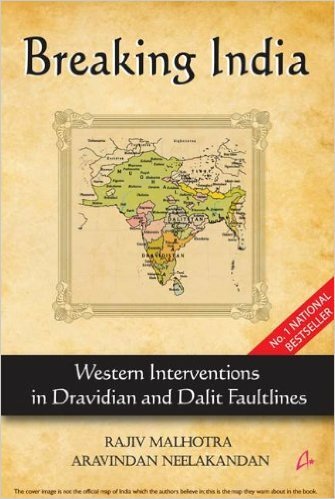 At that time, I have not read Mr. Rajiv Malhotra’s book Breaking India. Though I knew very clearly that the Aryan Invasion theory and other such theories were crackpot scholarship of the Missionaries, my thoughts were never reaffirmed until after reading Mr. Malhotra’s book. Like that cab driver with whom I spoke there is a considerable amount of population that lives under the misconception of such manufactured histories of British, or simply Missionaries. The author skillfully traces the evidence of how center of gravity of global evangelism has moved from Europe to US in the recent decades. And how the Christian missionaries and other anti-National forces have played to the internal fault lines of India to further balkanize and ultimately break India in to pieces. Though the west boasts about the scientific temperament as a virtue they hold as a society, they conspicuously downplay their justification and practice of slavery for centuries which was duly supported by Christian dogmas. They claimed that all the people they have colonized were the descendants of Ham (a biblical myth) and these people were needed to be enslaved for their own good. It is akin to a butcher saying, that it is in the interest of goat he slaughters it, so that the goat could go to heaven. Mr. Malhotra exposes the global nexus of Church organizations with politics, intelligence agencies, Maoist terrorists to name a few. India is being attacked from every side and Indians are not taking a serious note about it. Our common understanding is that our only enemy is Pakistan. It is Jihadis, Communists/Maoists, Christian Missionaries and the other sold out Indian sepoys of these forces and more. The threat is real and formidable. We are surrounded by regimes whose ideologies of death cult are posing a constant threat to India’s existence. But, we don’t take these challenges seriously. It is only because of such disunity from Afghanistan to Myanmar the original territory is now shrunk to its current form. If measures were not taken there might be at least four more independent countries in India, from Kashmir to Northeast to Punjab to Tamil Nadu. It is not the slavery under Islam India suffered which had devastating impact, but it is due to the organized destruction of all that is Indian has had a lasting impact on Indian mind. The Islam just wanted to stamp Indians out, just like it did with all the other cultures/religions in the wake, but we stood out though with huge losses. But with British (or Christianity) India faced a different problem – Deception, lies and backstabbing. For India, Jihadi is a quantified enemy, but the missionary crook is an invisible enemy. This is a new generation warfare where the enemy can see us but we cannot see them. And his tactics are fool proof. Every chapter in this book – Breaking India can be worked out or researched as a PhD dissertation, such is the scope for further work on each chapter. For eg: – How the Europeans have invented the Race theory and how they have used it to colonize a vast majority of global population warrants a more thorough study on its own. The whole book centered around the following themes in my opinion. Inventing the myth of a separate Dravidian identity. The foundation of Christianity is built on lies and deception on which the west thriving. Of all the greatest lies which were churned out as scholarship, the Aryan-Dravidian dichotomy had a lasting impact. That originally Tamil People were ruling the whole of India, then came the wily Brahmins (i.e., Aryans) from Central Asia who drove the Tamils to the current territory of Tamil Nadu. Well, if one is not swayed by the allurements for converting in to Christianity he would laugh his brains out because of this scholarship. This theory is for Tamil Nadu only. For example, different stories are cooked up for different states to confuse Hindus, to prepare them for conversion in to Christianity. 2. Using Dalit issue as a front for conversion purposes. The greatest irony of all is to say that Christian Missionaries are working Dalit cause. History is replete with incidents of the butchery Christianity (or simply the church) committed since its inception as recent as assisting Hitler in the genocide of Jews. Dalit issue is a legitimate concern and it should be resolved with in the broader Hindu framework and it does not require the intervention of foreign ideologies be it, Communism, Christianity or Islam. 3. Missionaries building an anti-India narrative and showing solidarity to the centrifugal forces in India. The role of Missionaries in the Maoist belt and violence in North East is indeed disturbing. The fact that political leadership in India could not muster courage to deal with these forces head on, all for the sake of vote bank politics is worrying. If such an attitude continues then India as we know will not be there anymore. 4. Crackpot scholarship by Christian missionaries and organizations that justifies the past injustices and a rationale for armed violence, so as to balkanize India. All publications of Church have derogatory references about Hindus and Hinduism. Only few instances as mentioned in the book are taken up by Hindus, others are just ignored. St. Thomas story is a great hoax of all. There is no evidence of his existence at all what so ever. It is only rhetoric. 5. A global network of organizations in the name of Dalit rights who create and control the anti-India agenda. What should worry us as Indians is the sheer capacity of these organizations to mobilize funds for their destabilizing activities in India. Thanks to Foreign Contribution Regulation Act (FCRA rules & act), there is a chance at least to monitor movement of these funds. Every year there are thousands of crores received by these missionary organizations as contributions for conversion and other disruptive activities. 6. Communists/Maoists, Jihadis, Christian missionaries – all find a common cause in the destruction of India. Elsewhere I have written about the nexus of Jihadis and communists in India, though they are enemies outside territory of India. This applies to Christian missionaries. So, Maoists, Jihadis and Christian Missionaries (or simply church) are enemies of each other, but when it comes to India all join hands for the destruction of India. Such is the threat we are facing. The first step in thwarting a threat is to recognize that there is one. So, far there is no evidence to suggest that we as a continuing civilization have recognized the threat yet, and it is about time we just did that. The Author meticulously documents about the activities of the individuals who are known agents of Church, but subtly suppress their identities at times. And flaunt their association when it suits them. From John Dayal to Mangalwani, the list is lengthier. From the King Sivaji to Guru Gobind Singh and other unknown number of patriots have made enormous sacrifices to keep this country from the savages of foreign lands. We shall too do our own part in sustaining this civilization. This entry was posted in BookReview and tagged Book Review, Comment, India, Indian Politics, RajivMalhotra. Bookmark the permalink. Vote bank politics is the culprit of course, But why are the true facts about the nehru – gandhi dynasty and their real motive and deliberate lies still a hush hush story ? Surely , motilal neru was not a Hindu . Nor are any of his progeny . The word ” secularism ” for and in an ALREADY PLURALISTIC society that Bhaarat was/is , has to be deleted forever , from Her Constitution . It has been very mischievously and blatantly been introduced by the nehrus to commit internal genocides of the majority Hindu population & their Sanskruti for the ultimate Purpose of eradicating it and pushing the Internal enemies’ agenda of self ( muslim – christian nexus ) aggrandizement and their avowed goal of dar – ul – islam & a world christian order .